I am not sure if the Magic lantern team are wearing shoes, but if they do then the other show just dropped. This is great news, bringing the possibility of raw video to a camera under the $1000 price tag (comparing to a $3300 5DmkIII). More info and videos after the jump. As with the previous raw video hack, this hack is only capable of recording a short video clip (about 10-15 seconds long, depending on card speed and settings) but if the route of this hack is similar to the one of its predecessor, things will improve and longer sequences will get enabled. The max resolution so far is 1734×976 (16:9), but it will only get you a few seconds of video, even with a fast, x100 card. “You should to test 720p and lower resolutions. SD card interface in 60D is not fast enough for 1080p and it writes max ~10-20MB/s” – If the interface is not fast enough, it would be pretty darn hard to make the 60D ever shoot 24P RAW videos at 1080p, it would be like trying to empty a toilet with a drinking straw rather that a 2″ pipe. Time will tell. two)” – this is no good news if you got the less buffed version. It would be cool to know how to distinguish the two with serial numbers or manufacturing dates. 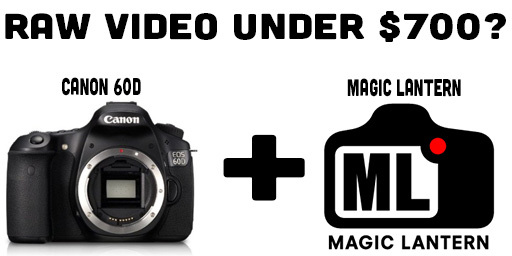 You can follow the test and announcements as they roll on the ML 60D RAW video – it’s working !!! forum thread. « Dear Canon/Nikon/Panasonic Can I Use Custom Firmware With My Camera?